Item Listing Colloidal Silver Generator by SilverGen utilizing CONSTANT CURRENT technology. SG6 Automatic Shutoff Generator with built in stirring motor to prevent agglomeration. Look no further. This is the best LVDC generator you will find available in the world. No other generators have a stirring motor, a CONSTANT CURRENT regulator, automatic shutoff and variable PPM control. This generator attaches to any standard mouth glass jar. The stirring motor and CONSTANT CURRENT is what really makes a difference. The silver atoms are separated as they leave the electrode and form a dense ionic cloud. By dispersing the atoms as they are being released, no agglomeration occurs and the result is clear CS of the smallest particle size. It also has polarity reversing so the electrodes do not need to be cleaned between batches. SG6-EURO Automatic colloid generator. Completely automatic. Operates on 220-240 VAC 50-60Hz This is exactly the same unit as the SG6 Auto but operates on European voltage. Electrode assembly for use with the SG7 Pro generator. This assembly will produce several thousand gallons of CS depending on the strength. Electrode plates are .9999 pure silver. A bright little flashlight with (8) super-bright white LEDs in a circle and a 5mW red laser right in the middle. One click and it's a flashlight, another click and it's a laser pointer. (Note: flashlight and pointer can't be on at the same time.) 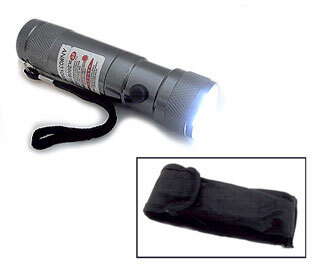 Measures 4-3/8" long x 1-1/8" dia in dark silver aluminum with knurled grips at both ends, and comes with a black-canvas belt pouch and a wrist strap. The flashlight lasts 30 hours on a set of new alkaline batteries The laser will last hundreds of hours on one set of batteries. (3 "AAA" heavy duty batteries included. No S/H if ordered with generator or meter. We will adjust invoice to show mailing charge if ordered separately. A book dealing with Colloidal Silver. Written by Warren Jefferson. 64 pages. Contents: Historical & current uses. The latest research. Choosing the best product. Making Colloidal Silver at home. Product suppliers. No S/H if ordered with shippable items. We will adjust invoice to show mailing charge if not ordered with shippable items. Calibration solution. (HI7033) 230 ml. If ordered with PWT meter shipping is free. Electrodes .9999 (99.99%) fine silver. They are for the SG6 model. 2 per set. Order 4 sets and we will include the fifth set free. Shipping is free if ordered with a generator or any other shippable items. We will charge $7.95 shipping in the U.S.and will correct the invoice when we ship. Out of country shipping will be $14.95 and will NOT be insured. CART WILL NOT SHOW SHIPPING CHARGE. Stirring Rod for SG6 Auto generator. If you want one for our older model, we used several different motors over the years so you will need to let us know the type motor and/or the stirring rod you have. In the checkout you will be asked how you found us and you will have to enter something in the box in order to proceed. Just tell us the motor shaft characteristics. Is it short and square, about one quarter inch in diameter or about one sixteenth inch in diameter? We will charge $7.95 shipping in the U.S.and will correct the invoice when we ship. Out of country shipping will be $11.95 and will NOT be insured. We'll figure it out or email you if necesssary. The SG6 Auto comes with a stirring rod so don't order one unless you want a spare. A stirring rod for the older model will be $4.00. We will correct the charge.